The bulk of "The Land Where The Blues Began" is focused on the trips Alan Lomax made for the Archive of American Folk Song at the Library of Congress during 1941 and 1942 in Coahoma and Bolivar Counties. These trips were carried out in collaboration with John Work and Lewis Jones of the Fisk University. A partnership which was seen by Lomax as serving a dual purpose; to establish a centre for black folklore at the University and, more importantly, "if prestigious Fisk became involved in folklore work, I reasoned, black intellectuals might overcome their prejudices against the oral traditions of rural and unlettered blacks". Lomax, of course, wasn't new to field research. In 1933, at the age of 17, he had accompanied his father, John, to make recordings of "The secular songs of the Negroes" in their home state of Texas using an Edison cylinder machine. The trip took them to Texas prison farms, plantations, barrel-houses and lumber camps. Their discoveries were later documented by John Lomax in his book "American Ballads and Folk Songs" (Macmillan 1934) and, of special interest to readers of this magazine, the notable find of Ivory Joe Hunter whom they recorded singing a version of "Stackolee" at Weirgate, Texas in the summer of 1933. The Lomaxes then moved on to Louisiana where a modern disc recording machine, sent by the Library of Congress, was awaiting their arrival. This they were hoping to use to record work songs at the State Penitentiary at Angola. In this objective they were thwarted because the institution had put a ban on inmates singing while they worked, however, the Lomaxes were fortunate to discover a self styled "king of the 12-string guitar players of de world" - Lead Belly. The rest is history and the period between then and where Alan Lomax takes up his narrative in "The Land Where The Blues Began" has been systematically chronicled in a series of releases on the Flyright label during the 70s, compiled and annotated by John Cowley. What that series highlighted more than anything else (and something that Cowley took great pains to impress upon us) was that the choice of singers, the repertoire, the locations at which they were done and Lomax's interrogation of informants, were very much a product of his need to discover for himself just what was connecting the various musical forms he encountered and how black culture and the blues evolved. For those who have listened to the Flyright albums and studied what Cowley had to say in his accompanying notes, the publication of "The Land Where The Blues Began" will bring valuable insight into the "raison d'être" of not only those recordings but also Alan Lomax himself. Fifty years ago Lomax simplistically described to Son House what he was attempting to achieve thus: "History wasn't just made by kings and presidents and people like that; we've found out that the people who plow the corn and pick the corn have a lot to do with it. My job is to help you get down the history of your people". This may sound patronising but the urge to do so may have been sparked by his run-in with the Tunica County Sheriff who arrested Lomax for daring to call Son House "Mister". There are undertones in the book that suggest that Lomax's concern to document black repertoire and performance was his way of making "invisible men", like House, visible through their recordings. Here for the first time Lomax admits that what he encountered in his travels deeply affected his feelings - feelings which he had to keep to himself, "nor could I discuss them with my father, who, in spite of his intense sympathy for the prisoner's and genuine concern for black welfare believed in the overall beneficence of the Southern system". When reading the narratives in the book I found myself almost at one with Lomax mainly, I suppose, because for me it was the vivid descriptions by Broonzy, Sonny Boy Williamson and Memphis Slim in Alan Lomax's documentary recording, "Blues In The Mississippi Night", that opened my young and impressionable ears to the blues in 1962. The entire transcript of that conversation is given in the last chapter of "The Land Where The Blues Began"; Lomax insists that he is identifying the speakers by their real names for the first time, even though he did just that forty years ago on a BBC Radio program. The fascinating reams of autobiography are broadly thematic - secular or religious - the secular covering areas like, minstrelsy, work (cotton field, railroad or levee camp), blues, children's games, square dances, etc. Reportage isn't always chronological (the implication, however, being that it is) which, doesn't necessarily matter, but if one knows that, for example, Muddy Waters recorded in 1941 and 1942 it becomes apparent that Lomax is getting sessions and events confused. If space permitted I would attempt an outline of the chronology and methodology of the Fisk trips but that is an article in itself and much better in the hands of someone competent to write it (hint, hint, John). However, it wasn't only with a recording machine that Lomax attempted to preserve for posterity this information; he also kept note books and used a questionnaire. This questionnaire, I'm reliably informed, asked specific questions as to the performer's knowledge of songs, song types, dances, work and even other singers, thereby allowing Lomax to build up a picture of how, when and where certain repertoires transmuted or manifested themselves in the different settings or environments he visited. "The Land Where Blues Began" almost solely relies upon these speech recordings and notes. Lomax appears to have little time for commercial recordings and also, I suspect, an underlying contempt for any blues research which is exclusively based upon such recordings. This is perhaps understandable given that Lomax has made no bones about the fact that his quest has always been for uninhibited self expression. However, to totally ignore other blues research and almost operate in a vacuum (as Lomax appears to) lays him wide open to ridicule. Those of a less tolerant or understanding nature could well write off this work as "rubbish" before the end of the first chapter. As an example, four pages into his tale, he confuses Willie Blackwell (whom he calls Willie B.) and William Brown and doesn't seem totally convinced that the latter is NOT the same person who recorded for Paramount and was the singer referred to by Robert Johnson in "Cross Road Blues". However, the Johnson connection is then used as a springboard for Lomax to expound his version of the Robert Johnson fable and in doing so ignores almost everything written or researched about Johnson in the past decade, thereby perpetuating myths we'd all thought dead and buried. Lomax appears unwilling to acknowledge the majority of blues field work carried-out over the past thirty years unless either it, or the researchers concerned, employed the cantrometric approach, that is, the examination of song as a measure of man on a global scale. For someone like myself, whose understanding of the blues is largely based on the research Lomax chooses to ignore, I found this myopia irritating but accept where he is coming from because there is little doubt that Alan Lomax is genuine in his desire to provide for the reader "a viable explanation for the emergence of the blues, the most popular song form we know anything about" through the experiences of those he encountered. This emergence he traces back to Africa (via an insightful chapter on pan pipe player, Sid Hemphill), then via work and prison songs, accounts of those who worked on the steamboats (thereby covering a much neglected area), levee workers (actually taking note of John Cowley's pioneering study, "Shack Bullies And Levee Contractors"), gospel singers (most notably Charles Haffer Jr whose portrayal in song of contemporary events is astonishing), through to the blues singers themselves. Lomax not only includes contributions from artists like Muddy Waters and David Edwards whom he interviewed for the Archive but also others like Fred McDowell, Jack Owens, Eugene Powell and Sam Chatmon to whom he spoke between 1950 and 1970. For readers of this magazine "The Land Where The Blues Began" sheds new light upon artists about whom we've perhaps become rather blasé. The most interesting I found to be Lomax's description of the contents of Muddy Waters's home which speak volumes about the man and his music. Like, for example, the 78s beside his Victrola; two Arthur Crudup Bluebirds, one Peetie Wheatstraw Vocalion, Tony Hollins's "Crawlin' Kingsnake", a Jay McShann Decca (not named but I wouldn't mind betting it was "Confessing The Blues") and a sermon by Elder Oscar Saunders. When questioned about his likes and dislikes in music, Muddy's favourite radio star was Fats Waller whilst Walter Davis his favourite recording artist. His current repertoire included items like "Home On The Range", "I Ain't Got Nobody", various Walter Davis and John Lee Williamson numbers as well as his own blues one of which he said was called "Canary Bird Blues"; presumably the same song as he recorded for Aristocrat in 1949. There is also a transcription of what is said to be Muddy's "32-20 Blues" but it bears no relation to the song of the same title that appears on the recent MCA set! David "Honeyboy" Edwards, on the other hand, has some precise and fascinating things to say about Lester Melrose and the way he worked with (and paid) his artists revealing that, "The last time I went to Chicago for him I made eight records for ninety dollars outside expenses and all I want to drink. And I met Lonnie Johnson, Tampa Red, Walter Davis, Pinetop, Roosevelt Sykes and Memphis Minnie". To the best of my knowledge Edwards has not from that day to this ever laid claim to having made commercial recordings prior to Lomax's discovery of him. Bearing in mind that the interview was contemporary and that Edwards hadn't yet been "got at" with the sort of leading questions asked of him today, could there be some unissued Honeyboy Edwards sides perhaps under pseudonym? More likely though he may have been one of the many unidentified guitar/harmonica playing accompanists that seem to abound in the pages of Godrich and Dixon. Edwards also took Lomax to a jook joint, The Dipsie Doodle, and taking out his notebook Lomax immediately "approached the jukebox, research bound, for we planned not only to record more fragments of folk song that still remained in this urbanised country, but also to study that musical shrine of the generation, the mechanical phonograph". At that shrine he found amongst others, Tampa Red's "Don't You Lie To Me", Big Bill's "When I've Been Drinking", Frank Edward's "Terra Plane Blues" and a record by a black vocal group entitled "Biscuit Baking Mama" and perceptively observed that "most of the singers no longer lived down home but they knew how to contrive a song that appealed to the home folks". In an appraisal as short as this, one can only but hope to give a flavour of the 500 pages that make up this important work. 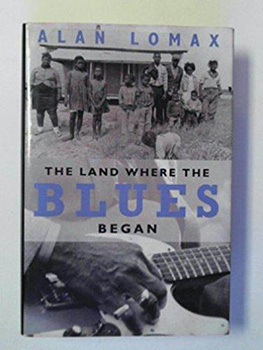 For someone like myself with a very polarised view of the blues, a book of this nature could have benefited with an introductory chapter explaining how Alan Lomax approached his various tasks, his methodology and generally what he was all about. You might think this an odd thing to suggest since, by reading the book, such matters should become abundantly clear. For me they didn't and at times the approach left me feeling exasperated with myself for allowing Lomax's blinkered view to dismiss what he was saying. The book only really made sense after numerous consultations with John Cowley, from whom I gained a better understanding of Lomax and his work. Unfortunately most buyers won't be that privileged but perhaps there's scope in a future issue of this magazine for an article on just such a topic. One final point. "The Land Where The Blues Began" is simultaneously published in America (Pantheon) and Britain (Methuen) but be warned that the British edition omits half the illustrations including those of Forrest City Joe and 'Bama.